Clawing and scratching is one of those undesirable behaviours that can get a cat in trouble, especially when the item the cat decides to shred is expensive! Often times, scratching results in a frustrated owner and the cat ends up surrendered to the local shelter. But, this doesn't need to be the case! Cat owners need to understand that although this behaviour irritates us, to them it is perfectly normal. Cats claw for many different reasons; to mark their territory, to sharpen their claws, and to stretch their muscles. Scratching is a basic need for all cats! They're not clawing at your furniture out of spite or anger, they're simply clawing because they're a cat! Fortunately for you, there are some things that you can do to discourage your cat from using your furniture as a scratching post! Here are some tips! Provide an appropriate scratching surface for your cat. Scratching posts or trees work very well. Some people even wrap table legs is sisal (grass fibre twine) or other fabric for their cat's scratching needs! Give your cat options! Provide them with both vertical and horizontal scratching surfaces. Some cats prefer one over the other, while other cats will use both depending on what they're in the mood for on any given day. Ensure the scratching post or cat tree is sturdy enough that it won't tip over while your cat is using it. In some cases, it may be necessary to secure the post to a solid surface, such as the wall. If your cat has already chosen a scratching location that you find unacceptable, make that area as unattractive as possible. Placing a plastic runner over the surface will usually deter a cat from scratching at a given surface. At the same time, place an acceptable scratching surface (i.e. a scratching post or cat tree) near the location, and make this new surface as attractive as possible. Once your cat is using the alternative scratching surface regularly, you can slowly move it to a more acceptable location, if desired. Remember to move the scratching surface a short distance at a time, so as to not confuse your cat. You can also remove the runner or whatever deterrent you used to make the original area unattractive to your cat. Households with more than one cat require a separate scratching area for each cat. 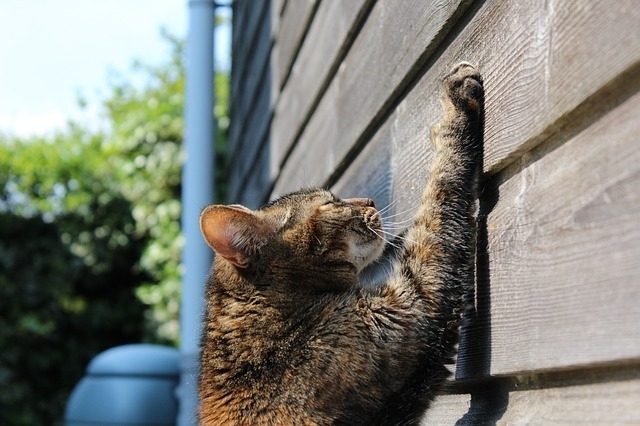 Scratching surfaces are an essential basic need for felines, and your cat will likely not be willing to share.